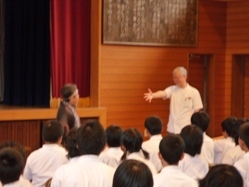 Our school doctor, Dr. Suzuki, had his special class for students about food and health. "Our daily meal affecct to your ten year later body." he said. All the students had great interests in his class. Copyright © Ｊinseki Junior High School All Rights Reserved.